I wrote the following brief article a couple of months ago for publishing in the British TruthSeekers Review, and thought that it might arouse the curiosity of some in this newsgroup. I first heard of it while in conversation with a Peruvian UFO researcher. What follows is the compilation of information that was subsequently sent on to me after I spent much time ringing contacts around Lima. 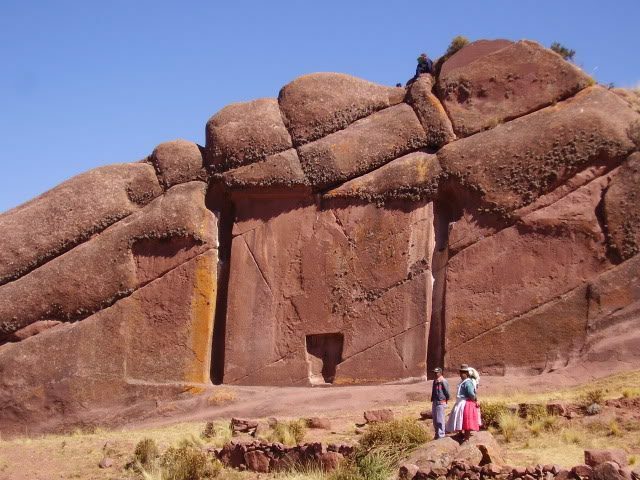 A huge mysterious door-like structure has recently been discovered in the Hayu Marca mountain region of Southern Peru. Hayu Marca, 35 kilometers from the city of Puno has long been revered by local Indians as the “City of the Gods“, and has never been fully explored because of the rugged mountain terrain. Although no actual city has ever been discovered, many of the rock formations of the region resemble buildings and artificial structures. 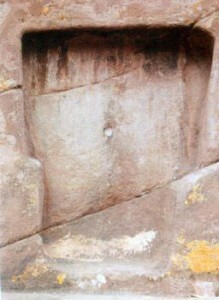 The door, or the “Puerta de Hayu Marca” (Gate of the gods/spirits) has been at some time in the distant past carved out of a natural rock face and in all measures exactly seven meters in height by seven meters in width with a smaller alcove in the center at the base, which measures in at just under two meters in height. Jose Luis Delgado Mamani stumbled across the structure while trekking through the surrounding foothills trying to familiarize himself with the area as his job is as a guide for mountaineering tourists. According to some individuals who have laid their hands on the small door, a feeling of energy flowing has been commented on, as well as strange experiences such as visions of stars, columns of fire and the sounds of unusual rhythmic music. Others have said that they have perceived tunnels on the interior of the structure, though nobody as yet has found a gap that would illustrate the door opening, on the contrary the professional opinion is that there is no actual door, for the frame and the entranceway and the back of the alcove are all carved from the same rock. It is interesting to note that the structure undeniably resembles the gate of the sun at Tiahuanaco and five other archaeological sites which link together by imaginary straight lines a cross with the lines crossing each other exactly at the point where the plateau and lake of Titicaca is located. News reports from the region over the last twenty years have indicated sizable UFO activity in all of these areas, especially at Lake Titicaca. Most of the reports describe glowing blue spheres and bright white disk shaped objects. The afore mentioned legend concludes with a prophecy that the door of the gods will one day open “many times bigger than it actually is…” and allow the gods to return in their “sun ships…”. Paul Damon TruthSeekers Research INT. S.A.I. Posted in South America HistoryTagged South America, Lake Titicaca, Peru, Archaeology, City Of The Gods, Hayu Marca, Lima, PunocommentLeave a Comment on STARGATE FOUND IN PERU?